Texas Hold’em is the poker variant which has taken the world by storm in recent decades, attracting players online and offline in huge numbers, all hoping to win some of the millions of dollars sloshing around the industry. 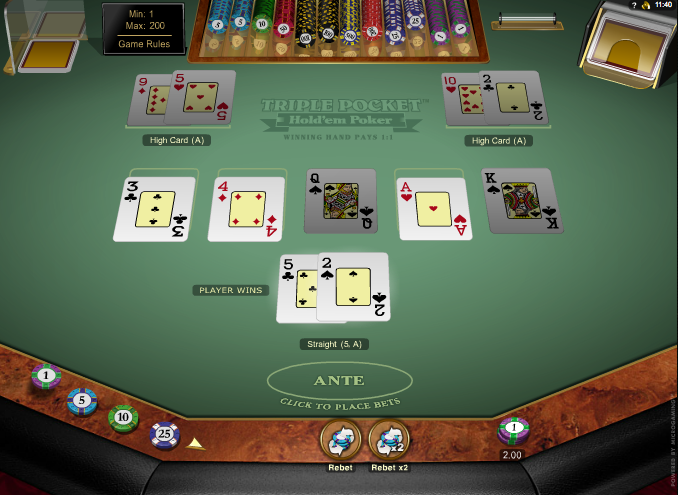 Online casinos offer various options for solo play and Triple Pocket Hold’em is one such example. It’s from Microgaming and it introduces an extra element of strategy into the gameplay. When you first load up this game you will see that it looks similar to other Texas Hold’em software but notice the two dealer positions above the community card area. Begin by choosing your bet level with the chips in the bottom left hand corner; available bets range from £1.00 – £200 per hand so there’s something for everyone. Now get things started by clicking the ‘Deal’ button and two cards will be revealed to you; now you have a choice – keep these cards or pass them on to the dealer. If you choose to pass them on two more cards will be dealt; again, choose to keep them or pass them on to the second dealer spot. You must now accept the their hand dealt to you. You can keep the first or second hands by clicking the ‘Hold’ button if you think they’re competitive enough. Essentially that’s the only decision-making required; the flop, turn and river are laid out in the centre of the table in one deal and there’s no more betting. In our view this barely qualifies as a Texas Hold’em variant because the only decision-making involved is which starting hand to keep. However it’s a playable card game and your returned should be Ok if you play some sensible strategy.